A day which ended with the big Badenoch clubs both upset away from home saw Lovat go top of the Orion Premiership. Glenurquhart defeated Kingussie 3-1 in the quarter-finals of the Artemis MacAulay Cup, while Lovat pulled off a 3-0 eclipse of champions and now former leaders Newtonmore in their top-of-the-table encounter in Kiltarlity. Lovat, even without Premiership top scorer Greg Matheson, made smart work of Newtonmore to go a point clear of the champions and of Kyles, with all three having played 10 of their 18 games. Lovat's vital breakthrough came just before half time through Duncan Davidson and it stayed finely poised for 20 minutes until Fraser Gallacher got their second, then their clincher late on. However, new Lovat manager Allan MacRae is still playing down the prospect of his side, who came close to reelgation last season, pulling off a title win. At the other end of the table, Bute are going through a torrid time and are now two points adrift of Kilmallie at the bottom after a 10-0 mauling from them at Canal Field. Michael Roger got four with doubles from Grant MacKenzie, John Stewart and Liam MacDonald. Despite Kilmallie's two points, both sides here are in danger of becoming detached from the rest of the table since the teams above them have two or three games in hand. In the MacAulay Cup, Glenurquhart must have been very glad their tie against Kingussie didn't go to extra-time and penalties. Because that was how Newtonmore put them out of the Co-op MacTavish Cup three weeks previously and they would also still have been playing when the Olympic Torch relay went right past Blairbeg Park just before 17:00 BST. A Neale Reid double sent Glen well on their way and James MacPherson got the conclusive goal on 68 minutes before Ronald Ross pulled one back on 80 minutes. This was a welcome result for Scotland and Glenurquhart manager Drew McNeil who has been concerned about his team's consistency all season. Gary Innes got four, the last one a penalty, for Fort William in their 6-2 win over Kinlochshiel at Black Park in the other MacAulay north tie. 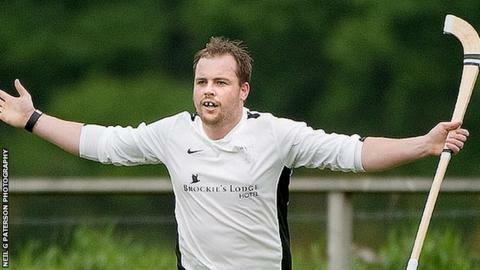 Bryan Simpson and Gordy MacKinnon completed Fort's bag and Duncan Ach MacRae got both Shiel's goals. In the south, Glasgow Mid Argyll's cup heroics didn't stretch to a second Saturday and they lost 5-0 at home to Inveraray for whom Chris Crawford got four and Gary MacPherson the other one. The other south tie between Onan Camanachd and Bute was delayed since Mossfield Park Oban was being used for the MacAulay six-a-side tournament. Oban Camanachd, who have been making headlines for all the wrong reasons with further sendings off in recent weeks, got their act together this time and maintained their 100% record in South Division 1 with an 11-1 battering of Aberdour, including five from Andrew McCuish.